A friend of mine made a recent trip to Cincinnati, and while there he made a trip across the border into Kentucky to visit his favorite liquor store. He inquired as to whether there was anything in particular I wanted him to look for, and I just told him to grab something that I couldn't find here in Illinois. And so, he came back with a private selection Knob Creek Single Barrel, along with a story about this particular bottle passed onto him by the owner of the store. The store he visited was Liquor City, owned by the Gallenstein family. In selecting this particular bottle, they had five different people go to the Jim Beam distillery to do a tasting of different barrels and vote on the ones they liked best. Among the different tastings, this particular barrel was the only one that received a unanimous "yes" vote. Per my buddy, as relayed with him (so take this hearsay within hearsay for what it is), this particular barrel came from the seventh floor of a nine-floor rickhouse. Despite that the bottle indicates it was aged 9 years, this particular bottling was aged 12 years. Having had regular Knob Creek previously, I was eager to give it a go, but I wasn't exactly holding onto any high expectations. 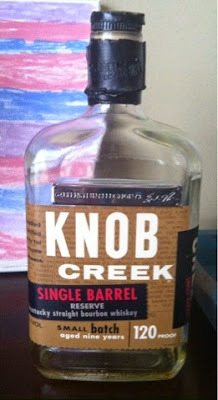 Knob Creek has always come across to me as somewhat ordinary, lacking any complexity in flavor or boldness. This, however, was unlike any Knob Creek I'd ever had before, and I could not have been more impressed. The bourbon was very sweet, with the classic caramel and vanilla flavors. These flavors were so prominent, in fact, it was like dessert in a glass. Although it was high proof, it managed minimal burn, allowing the natural flavors of the whiskey to come through immediately and to linger long after the finish. As I made my way through the bottle, I found that a slight cinnamon spice made its way up front, providing a flavor that was distinctively similar to one of my favorite drinks when I go out for burritos, horchata. Whatever factors the fine people at Liquor City were considering when they were selecting this barrel could not have been more in line with my own tastes and preferences. I found this bottle to be comparable with many high-end, high-proof bourbons I've tasted in the past, and at $35 (even though this was a gift), this was an absolute steal! I never thought I'd be giving a Knob Creek bottling as high a grade as I am, but it was truly that good, and such credit is due in this instance.